It's January. The month of restraint, restriction and renewal. Of low-fat, low-cal and low-fun. In theory, the cake tins should be banished to the back of the cupboard and the only weighing and measuring occurring should be the weighing of Body Mass Index and the measuring of waist circumference. In theory, salaries should be spent on gym memberships and diet plans rather than sugar and eggs. However, in practice, what this most gloomy of months needs is comfort and cheer. 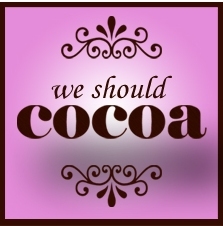 For this month's We Should Cocoa choc-tastic blogging challenge, the lovely Chele from Chocolate Teapot has set the theme 'health conscious'. Previously, we've firmly established here on What Kate Baked that chocolate is indeed terribly healthy and good for you. Hurrah! So, it was simply a case of making it even healthier. And voila! These mini chocolate orange fondue pots were born unto the world. 1. Set a pyrex bowl over a small pan of simmering water, ensuring the bowl does not touch the water. Pour the cream into the bowl and heat gently. 3. Pour into pots or mugs, start the dipping and enjoy! Taking minutes to prepare this is the perfect pudding and would also be very appropriate to enjoy apres-ski. Or while lounging on the sofa watching Ski Sunday. You know what I have always fancied trying a chocolate fondue and now I think I will. Had a lovely savoury fondue in France but it would have been even better with this as pudding! You really just can't go wrong with chocolate fondue. Molten chocolate mmmmmmmm. It has always been my dream to stand under a chocolate fountain in Thorntons with my mouth wide open.... I fear I may be banned though and I just can't risk being banned from Thorntons! Kate, what a lovely idea, I think you've converted me to chocolate fondue, just the thing for a family pudding in my house. Oh I do so like your idea of healthy :) What a fabulous simple but delicious pudding. Thanks for taking part. They look great! Are these healthy in the same way that broken biscuits contain no calories? ;-) It's a good idea for eating more fruit though - chocolate makes everything taste better! Healthy and one of your five a day - what could be better! What a great idea Kate, I LOVE chocolate fondues, and this is a winner! Thanks for taking part with such a great recipe! Lovely idea for the challenge. I'm still slightly puzzled by the idea of leftover cake - I've never come across any. There was a time a few years ago when every charity shop had at least one fondue set for sale but I've not seen one lately so maybe they're trendy again. Oh wow! Fresh fruit dipped in chocolate... so we get one of our five a day plus a chocolate fix. Great idea!